The last film review I posted on here was that of concluding Hunger Games installment Mockingjay Part II. I opened that review by talking about how much I appreciate films that are brave, films that attempt to break the mold and try something a little bit different. When the risks pay off, it can create something quite special: Mockingjay Part II ditched the childish tropes of other YA adaptations and went full force with themes of war, revolution and brutality, and it was a superb film. When the risks don't quite pay off, it can be a little underwhelming. The Good Dinosaur is one of those films that takes risks, dares to be something unlike Pixar have ever offered, but doesn't quite hit the mark. There are sequences scattered throughout that feel genuinely special, and the animation is breathtaking, but for the most part The Good Dinosaur is a humourless and, regrettably, lifeless experience. The base premise itself is nicely simple: what if that famous meteor that wiped out the dinosaurs was nothing more than a near miss. Dinosaurs and humans coexist, yet the former has become the more advanced species. Main protagonist Arlo and his family are farmers, but after Arlo is separated from his family by falling into a river during a storm, he is forced to bond with a primitive human boy he names Spot in order to find his way home. It's a wonderfully simple story, but is it just a bit too simple for Pixar? I mean, this is the production company who brought us the wacky ideas of The Incredibles and Ratatouille, the unprecedented ingeniousness of Wall-E and Toy Story, the heartbreaking emotion of Up and Inside Out. I'm not against Pixar doing something a bit simpler, so long as they do it well. I enjoyed Brave a great deal, even if it was nowhere near as original as other Pixar efforts. 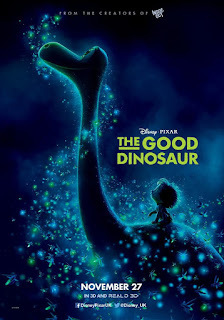 The issue with The Good Dinosaur is that it puts so much reliance on its thematic content that the humour and the storytelling become sidelined, and what should be an enjoyably simple story becomes unfocused, scattershot and dull. We can begin with what works, though. The Good Dinosaur sets up its themes very early on, this is a film about family, loss, journey and courage. Despite a plodding and meandering opening act, the film eventually finds focus when Arlo and Spot settle down on a riverside beach one night and tell each other about their families, with Spot revealing that both of his parents are dead. Except, it's done wordlessly. And it's beautiful. After feeling bored and underwhelmed for the first half hour, I suddenly found myself with a lump in my throat. In fact, in the film's closing act we are treated to another wordless exchange between Arlo and Spot, and again it's excellent. This film is at its best when it's silent, when the characters aren't talking. A Pixar trademark that audiences love nowadays is that fast paced, witty dialogue, and this film doesn't offer that at all, but it manages to offer that classic Pixar magic simply whenever the characters stop talking and the storytelling becomes purely visual. It's benefited further by some of the most gorgeous animation the big screen has ever seen. The dinosaurs themselves may be annoyingly cartoony, but the scenery and backdrops for this film are stunning. Where this film fares less well, though, is in its scripting. Even from the offset, something doesn't sit right about this world that Pixar have created here. The farming dinosaur idea feels forced, and Arlo's personality is built almost solely around the fact that he is weaker than his siblings. Once he gets lost, he rarely does anything besides scream, and his ultimate journey into becoming a brave dinosaur doesn't stick the landing. Early in the film we see each of the family place their muddy paw print on the wall of a silo by their home, yet Arlo cannot do this yet because he hasn't done anything worthwhile. Immediately after returning home, we cut to him doing this, and the scene falls completely flat. Arlo's journey just isn't told well enough, so when we come to his big moment it doesn't work. The film's structure is relatively similar to that of Finding Nemo, with two characters going on a journey to find a family member and bumping into a variety of other animals along the way. The reason this film doesn't live up to Nemo's standard, though, is because none of the supporting characters are particularly exciting, nor are they interesting nor funny nor clever in any way. A trio of good-guy T-Rex's fail to offer anything to the film's plot, the villainous pterodactyls never truly feel threatening. Almost everything about the film feels like it exists solely to push the main characters along to the following scene. It all just feels very run of the mill. Perhaps the thing that confused me most about The Good Dinosaur, though, is its almost total lack of humour. Even Pixar's weaker efforts (namely the two Cars films) still offer some solid humour throughout. While I would still place this above the original Cars film (I have a bit of a soft spot for the sequel, which I enjoy rather a lot) due to its brave thematic content and stunning animation, there are little to no laughs found here. Weirder still, it doesn't even feel as if there were a lot of jokes that just didn't land, it's legitimately difficult to locate any real attempts at humour across the full 100 minutes. Granted, there's a weird hallucinogenic sequence in the middle, and the dinosaur with all the various animals perched upon him was perhaps meant to be humorous, but they feel all laboured. The Good Dinosaur had an incredibly disruptive production, with both the film's director and cast being entirely altered by the time it reached distribution over two years later than planned. Unfortunately, it really really shows. Perhaps whoever was in charge of coming up with the film's jokes was fired without a replacement, as this is almost unarguably Pixar's least funny film. One thing that keeps playing on my mind is the notion that maybe I was so disappointed with The Good Dinosaur because it has an incredibly tough act to follow with Inside Out. Perhaps this is the case, but even without Inside Out in mind, this feels like a much lesser version of Pixar than we've seen since Cars. The storytelling is uneven, the humour is nonexistent, the dialogue feels corny and the supporting characters are uninspired. It's a huge relief that the film's scenery is so breathtakingly realistic and that the thematic content resonates so well, otherwise this would be an incredibly tough film to sit through. I don't think The Good Dinosaur is a terrible film, but it's difficult to imagine wanting to watch it through again when the one real moment the film needed in order to stick the story's landing is botched. It renders Arlo's journey almost meaningless. There are some wonderful sequences throughout, in fact that previously mentioned riverside scene ranks as one of Pixar's greatest ever. When this film took risks it worked fantastically well, but everything in between falls comparatively flat. You're better than this, Pixar. And I beg you, please do not drop the ball with your next film. Finding Dory needs to be a classic. 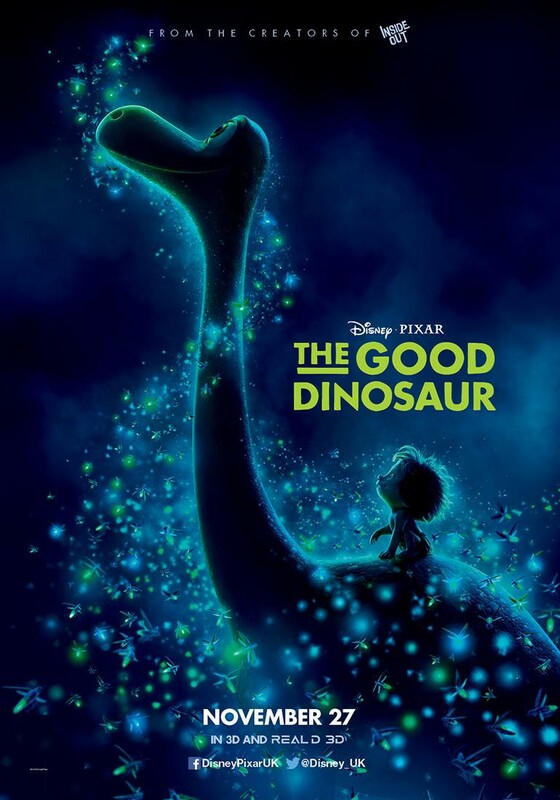 To Summarise: With weak storytelling and a lack of humour making for a brave yet unfulfilling Pixar outing, The Good Dinosaur is saved only slightly by its stunning animation and impressive thematic content.